The Nielsen, Pinta and the Santa Maria – calling 1952. While this post is about how viewers are ultimately measured, its also about the ad agencies and then their clients, the ‘big brands’ that are being billed monthly for advertising their brand on various TV outlets and others big media sources. Nielsen uses a technique called statistical sampling to rate the shows — the same technique that pollsters use to predict the outcome of elections. 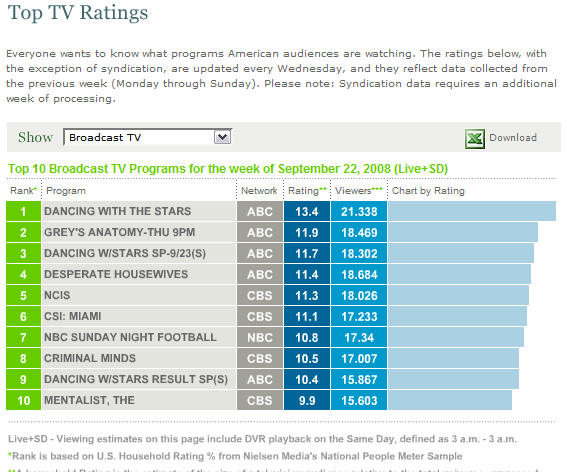 Nielsen creates a “sample audience” and then counts how many in that audience view each program. Nielsen then extrapolates from the sample and estimates the number of viewers in the entire population watching the show. That’s a simple way of explaining what is a complicated, extensive process. Nielsen relies mainly on information collected from TV set meters that it installs, and then combines this information with huge databases of the programs that appear on each TV station and cable channel. To find out who is watching TV and what they are watching, the company gets around 5,000 households to agree to be a part of the representative sample for the national ratings estimates. 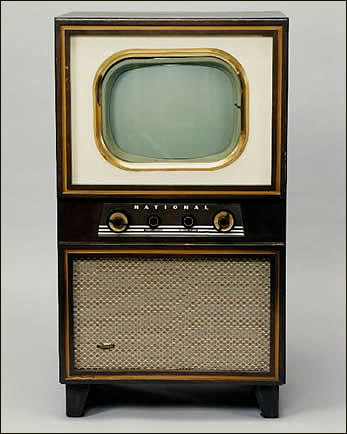 Nielsen’s statistics show that 99 million households have TVs in the United States, so Nielsen’s sample is not very large. The key, therefore, is to be sure the sample is representative. Then TVs, homes, programs, and people are measured in a variety of ways. To find out what people are watching, meters installed in the selected sample of homes track when TV sets are on and what channels they are tuned to. A “black box,” which is just a computer and modem, gathers and sends all this information to the company’s central computer every night. Then by monitoring what is on TV at any given time, the company is able to keep track of how many people watch which program. The national TV ratings largely rely on these meters. Are 5,000 ‘samples’ really representative of what 100 million TV sets are ‘watching’ 24 hours a day?? Someone in the household ‘pushes’ a button on a black box when he or she ends or begins viewing? I can barely get to my show on time never mind finding a button to push in the house on a little black box. Since I’m assuming that you, who are reading this right now are included in this statistic, have a TV and fall into place with these TV ‘habits’ or statistics from Nielsen ? I’m not finding fault with Nielsen. But you have to wonder how seriously does one take the ‘Nielsen’ ratings. Can’t this be done in a more accurate, better way in 2008? I can’t help but ask: Somehow, somewhere and in some possible way, can’t the internet make this data somewhat more accurate? Am I asking too much? Comments please. Surprised? But this is the bigger picture and important because it keeps things in perspective. This is how it is today. Consumers watched 10 billion online videos in December (comScore) . People watched an average of 3.4 hours of online during the month, up 34% from January 2007. TV audiences are shrinking. 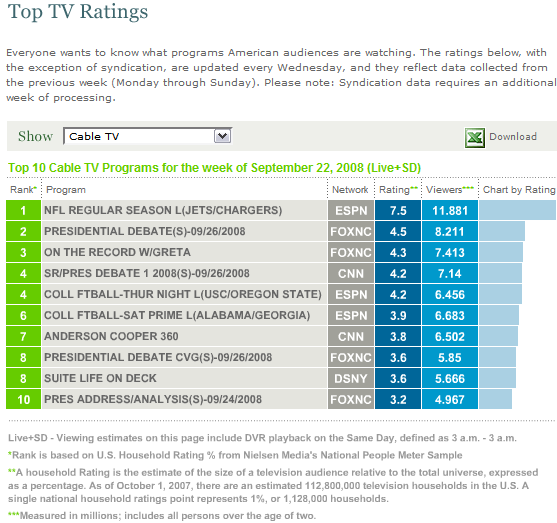 They are still big and can be huge (like the recent Superbowl numbers prove) but TV has a new competitor. The 10 billion videos watched online in December was the highest total since comScore started keeping track of the stat a year ago. Apple knows this. Apple has applied for a patent that allows widgets to be displayed on TV when you’re watching Apple TV . So imagine watching a movie and a small search widget (with advertising embedded in it of course) can be displayed if you want it that allows you to look for any actor or production person in the movie you are watching or reference other info at IMDB, for example. Or give you the ability to chat, read news feeds, get sports scores, etc. What a nice way to integrate the internet with TV viewing. Unobtrusive, but there. “With the writer’s strike keeping new TV episodes from reaching the airwaves, viewers have been seeking alternatives for fresh content. It appears that online video is stepping in to help fill that void.” This is what the Exec VP at comScore was quoted as saying. I’m not so sure that the writer’s strike had too much to do with these numbers. The growth in video on the web had been steadily increasing year after year. Consumers are spending less and less time watching TV – and that’s been happening now for many, many years – consistently. This is a trend that is not going away anytime soon. Google Sites once again ranked as the top U.S. video property in December with 3.3 billion videos viewed (32.6 percent share of videos), gaining 1.3 share points versus the previous month. YouTube.com accounted for more than 97 percent of all videos viewed at the property. Fox Interactive Media ranked second with 358 million (3.5 percent), followed by Yahoo! Sites with 340 million (3.4 percent) and Viacom Digital with 238 million (2.3 percent). I wonder if you’ll be able to get an Apple widget on a Google Panasonic TV set next year? Hmmmm, that will be interesting. * Rankings based on video content sites; excludes video server networks.